Is a german hornplayer, main point natural horn, teacher and instrument builder. Born 1972, he studied in Weimar with Reiner Heimbuch and Karl Biehlig, in Leipzig withHermann Märker, later studies of conducting and choir leading in Weimar. First orchestra experiences at the age of 17 with the “Vogtland-Philharmonie Greiz”, with 18 on the Theater of Erfurt, also “Junge Deutsche Philharmonie”and with 19 years he became 2nd hornplayer of the “Staatskapelle Weimar”. Since the 90th he specialized in historic horn instruments, he was participant of the “Naturhorn Festival Essen 1993”, also coached by the Frankfurt hornplayer Peter Steidle. Since 2002 is Stephan Katte freelancer and played most parts from J.S.Bach, also the extreme high cantatas Nr. 14, 16, 65 etc. with nearly all German ancient-music-groups, p.e. Akademie für Alte Musik Berlin, Concerto Köln, Les amis de Philipe, Das Kleine Konzert etc. In 2007 he discovered the horns of Anton Kerner sr. and jr. in the Moravian State Museum, played them from 2008-2010 and started to rebuild this instruments by himself in authentic handcraft style. 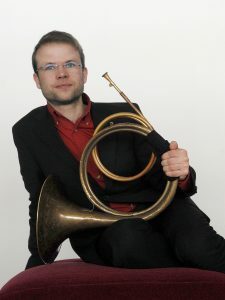 Stephan Katte is teacher for natural horn playing at the music university of Leipzig.